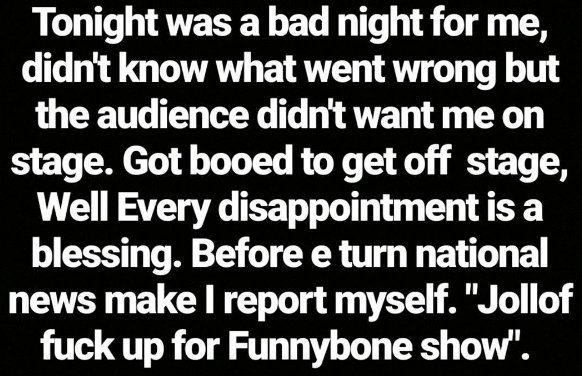 Comedian turned celebrity critic Mr Jollof was dragged to the mud at Funny Bone comedy show last night in Lagos. 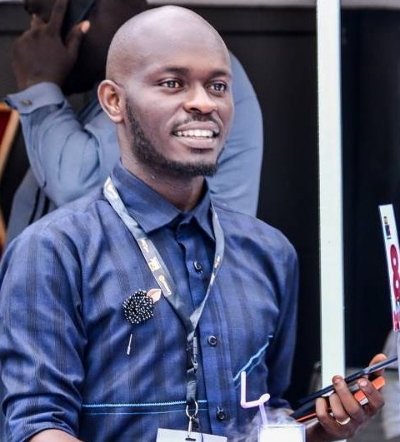 The Warri-based comic star who was booed off stage at the Eko Hotels & Suites yesterday told fans earlier today that he witnessed the angry and unforgiving side of Nigerians at the event even after leaving his base in Warri for Lagos with high hope. He was heartbroken when his efforts to make people laugh met cold response. Mr Jollof is however hopeful that his star will soon shine. If what he told fans happened for real, Mr Jollof should stop criticizing celebrities and politicians if he wants his career to boom. Let’s hope this is not another publicity stunt he is known for. Na catar de worry you. Go drink medicine. Nonsens.